For silicon on insulator optical devices, see silicon photonics. Lower parasitic capacitance due to isolation from the bulk silicon, which improves power consumption at matched performance. Resistance to latchup due to complete isolation of the n- and p-well structures. Higher performance at equivalent VDD. Can work at low VDD's. Reduced temperature dependency due to no doping. Better yield due to high density, better wafer utilization. No body or well taps are needed. Lower leakage currents due to isolation thus higher power efficiency. Inherently radiation hardened ( resistant to soft errors ), thus reducing the need for redundancy. An SOI MOSFET is a semiconductor device (MOSFET) in which a semiconductor layer such as silicon or germanium is formed on an insulator layer which may be a buried oxide (BOX) layer formed in a semiconductor substrate. SOI MOSFET devices are adapted for use by the computer industry. The buried oxide layer can be used in SRAM designs. There are two types of SOI devices: PDSOI (partially depleted SOI) and FDSOI (fully depleted SOI) MOSFETs. For an n-type PDSOI MOSFET the sandwiched p-type film between the gate oxide (GOX) and buried oxide (BOX) is large, so the depletion region can't cover the whole p region. So to some extent PDSOI behaves like bulk MOSFET. Obviously there are some advantages over the bulk MOSFETs. The film is very thin in FDSOI devices so that the depletion region covers the whole film. In FDSOI the front gate (GOX) supports less depletion charges than the bulk so an increase in inversion charges occurs resulting in higher switching speeds. The limitation of the depletion charge by the BOX induces a suppression of the depletion capacitance and therefore a substantial reduction of the subthreshold swing allowing FD SOI MOSFETs to work at lower gate bias resulting in lower power operation. The subthreshold swing can reach the minimum theoretical value for MOSFET at 300K, which is 60mV/decade. This ideal value was first demonstrated using numerical simulation. Other drawbacks in bulk MOSFETs, like threshold voltage roll off, etc. are reduced in FDSOI since the source and drain electric fields can't interfere due to the BOX. The main problem in PDSOI is the "floating body effect (FBE)" since the film is not connected to any of the supplies. SIMOX - Separation by IMplantation of OXygen – uses an oxygen ion beam implantation process followed by high temperature annealing to create a buried SiO2 layer. 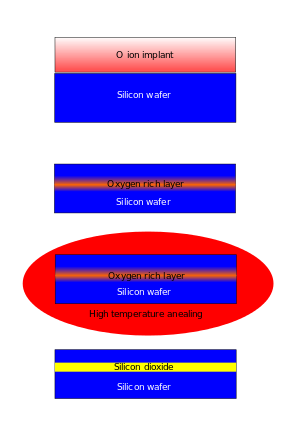 Wafer bonding – the insulating layer is formed by directly bonding oxidized silicon with a second substrate. The majority of the second substrate is subsequently removed, the remnants forming the topmost Si layer. One prominent example of a wafer bonding process is the Smart Cut method developed by the French firm Soitec which uses ion implantation followed by controlled exfoliation to determine the thickness of the uppermost silicon layer. NanoCleave is a technology developed by Silicon Genesis Corporation that separates the silicon via stress at the interface of silicon and silicon–germanium alloy. ELTRAN is a technology developed by Canon which is based on porous silicon and water cut. Seed methods - wherein the topmost Si layer is grown directly on the insulator. Seed methods require some sort of template for homoepitaxy, which may be achieved by chemical treatment of the insulator, an appropriately oriented crystalline insulator, or vias through the insulator from the underlying substrate. IBM began to use SOI in the high-end RS64-IV "Istar" PowerPC-AS microprocessor in 2000. Other examples of microprocessors built on SOI technology include AMD's 130 nm, 90 nm, 65 nm, 45 nm and 32 nm single, dual, quad, six and eight core processors since 2001. Freescale adopted SOI in their PowerPC 7455 CPU in late 2001, currently[when?] Freescale is shipping SOI products in 180 nm, 130 nm, 90 nm and 45 nm lines. The 90 nm PowerPC- and Power ISA-based processors used in the Xbox 360, PlayStation 3 and Wii use SOI technology as well. Competitive offerings from Intel however continues[when?] to use conventional bulk CMOS technology for each process node, instead focusing on other venues such as HKMG and Tri-gate transistors to improve transistor performance. In January 2005, Intel researchers reported on an experimental single-chip silicon rib waveguide Raman laser built using SOI. As for the traditional foundries, on July 2006 TSMC claimed no customer wanted SOI, but Chartered Semiconductor devoted a whole fab to SOI. SOI wafers are widely used in silicon photonics. The crystalline silicon layer on insulator can be used to fabricate optical waveguides and other optical devices, either passive or active (e.g. through suitable implantations). The buried insulator enables propagation of infrared light in the silicon layer on the basis of total internal reflection. The top surface of the waveguides can be either left uncovered and exposed to air (e.g. for sensing applications), or covered with a cladding, typically made of silica. Intel TeraHertz - similar technology from Intel. ^ a b Celler, G. K.; Cristoloveanu, S. (2003). "Frontiers of silicon-on-insulator" (PDF). J Appl Phys. 93 (9): 4955. doi:10.1063/1.1558223. ^ Marshall, Andrew; Natarajan, Sreedhar (2002). SOI design: analog, memory and digital techniques. Boston: Kluwer. ISBN 0792376404. ^ Colinge, Jean-Pierre (1991). Silicon-on-Insulator Technology: Materials to VLSI. Berlin: Springer Verlag. ISBN 978-0-7923-9150-0. ^ "IBM touts chipmaking technology". cnet.com. 29 March 2001. Retrieved 22 April 2018. ^ United States Patent 7138685 " Vertical MOSFET SRAM cell" describes SOI buried oxide (BOX) structures and methods for implementing enhanced SOI BOX structures. ^ "SIGEN.COM". www.sigen.com. Retrieved 22 April 2018. ^ Vries, Hans de. "Chip Architect: Intel and Motorola/AMD's 130 nm processes to be revealed". chip-architect.com. Retrieved 22 April 2018. ^ "NXP Semiconductors - Automotive, Security, IoT". www.freescale.com. Retrieved 22 April 2018. ^ "TSMC has no customer demand for SOI technology - Fabtech - The online information source for semiconductor professionals". fabtech.org. Archived from the original on 28 September 2007. Retrieved 22 April 2018. ^ Madden, Joe. "Handset RFFEs: MMPAs, Envelope Tracking, Antenna Tuning, FEMs, and MIMO" (PDF). Mobile Experts. Archived from the original (PDF) on 4 March 2016. Retrieved 2 May 2012. ^ Reed, Graham T.; Knights, Andrew P. (5 March 2004). "Silicon Photonics: An Introduction". Wiley. Retrieved 22 April 2018 – via Google Books. Advanced Substrate News - a newsletter about the SOI industry, produced by Soitec. MIGAS '04 - The 7th session of MIGAS International Summer School on Advanced Microelectronics, devoted to SOI technology and devices. MIGAS '09 - 12th session of the International Summer School on Advanced Microelectronics: "Silicon on Insulator (SOI) Nanodevices"
This page was last edited on 9 March 2019, at 21:29 (UTC).